3). Encoder-channel micro computer system. 4). Width x Height x Thick: 154 x 150 x 56mm. 9). Battery: b# attery 4 x 1.5V Or Ni MH 4*1.2V 1600-2000mAh (W/O). 11). USB online update makes you always enjoy the latest program. 12). adjustability of hi-frequency output power enjoys more personality and friendly environment. 13). up to 30-model data can be saved. 14). 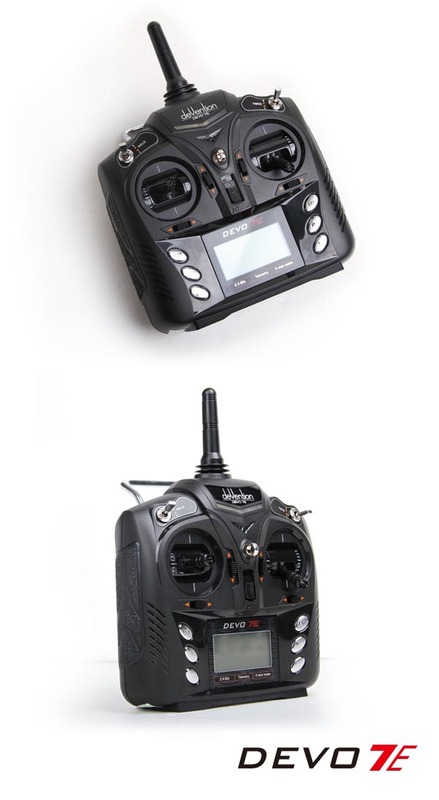 DEVO-7E adjusting the gyro sensitivity makes hovering flight and fancy flight in an easy way. 15). Wireless data transfer and trainer function between two transmitters. 16). Improved design of the Radiosticks make the control silky and smoothly. 17). 4 different kinds of stick mode.